Integrated Yoga/Meditation: Basic range of static, flow and restorative postures in alignment with wellness practices of Ayurveda and alignment of Iyengar. Meditation and breathing practices are included for mind-body-spirit “integration.” Adaptive/modified poses with props appropriate for physical limitations or low mobility. Asana (posture) focus is on proper alignment in a safe, non-harming range of motion. 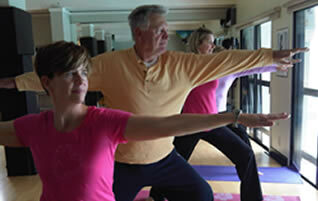 Lots of personal attention and inspiration in this mind-body-spirit class. Best for those who have completed TLC Yoga Series for New Beginners or those who have some experience with yoga practice or those who are fairly athletic. Don’t worry! No “pretzels”, handstands or headstands! TLC/New Beginner Yoga-Drop-In Class: Ultra gentle or entry-level foundation class including back care basics, meditation, visualization, breathing and adaptive/modified poses with props appropriate for physical limitations or low mobility. Asana (posture) focus is on proper alignment in a safe, non-harming range of motion. Lots of personal attention and inspiration in this mind-body-spirit class. Questions, more information: Contact Leena.